28 August, 2012. Alvin's newest CD, Still On the Road to Freedom has been released on Rainman Records in the USA and in Europe on Repertoire Records. The album takes listeners on a trip through time, embracing Alviin's love of roots music with everything from rock n' roll to blues to jazz to funk , led by his outstanding guitar work and a delicious groove that adds a cohesiveness to the varied styles. Still On the Road to Freedom is available at online retailers, dowload sites and in stores. Read on for reviews of the album, and then catch some of the new interviews with Alvin discussing it. You probably know Alvin Lee from his work with Ten Years After. That band will be forever famous for its wild set at Woodstock, immortalized in the documentary film (that version of "I'm Going Home" is one of the film's highlights), as well as for the song "I'd Love To Change The World" which reached #40 on the Billboard Hot 100. All of the album's songs were written by Alvin Lee. As for the idea of going back, there is a track called "Back In 69," (but it is more about the present than its title might suggest), and the final track is a remake of a tune from Ten Years After's 1970 album Cricklewood Green. Some of these tunes are pretty short. Tracks 2, 7, 8, 11, and 12 are all under two and a half minutes. There is a hidden song which starts at 5:33 on track 13 (it's a very short acoustic instrumental tune). 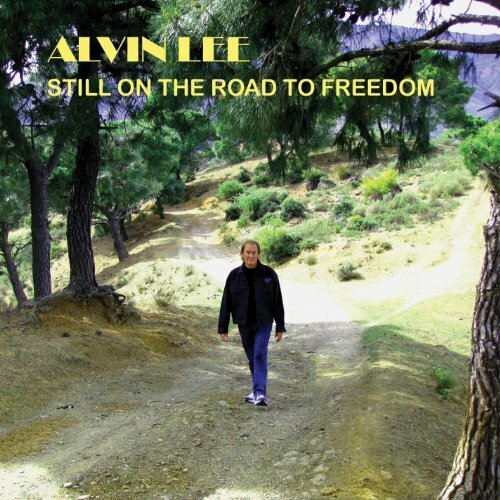 "Still On The Road To Freedom"
Still On The Road To Freedom opens with its title track, which finds Alvin Lee journeying "for a distant land where it all began." And yes, Alvin Lee's guitar still has that great late '60s, early '70s sound. It has that drive, that reach for new territory, an interest in exploration and expression that characterized a lot of the best music of the time. And the guitar is given the freedom to stretch out here, in the song's best section toward the end. The only thing I could do without is the echoes of "freedom." "Listen To Your Radio Station"
"Listen To Your Radio Station" is a bluesy tune that is nearly an instrumental. The opening vocal section, which begins "Listen to your radio station/Coolest music across the nation," ends with "Let's play some blues on this guitar" a little more than a minute in. The rest is instrumental. This song is an interesting mix of blues with a bit of a techno feel. "Save My Stuff" is straight blues with that fantastic, powerful harmonica. Like a lot of the best blues, it features simple, straightforward lyrics, in this case about riding the train home to the woman he loves. And then, "I'm gonna save my stuff for the woman I love." There is nothing complicated here, but this is a song you can immediately get into. You're on that train too, itching to get back to some woman, and enjoying the journey. A very cool blues tune. Perhaps the most surprising song on the album is "I'm A Lucky Man," a fun rockabilly tune with a definite 1950s style, particularly in the guitar, but also in the vocals. This song is a total joy. And while clearly revisiting an earlier form, the song feels like Now, more in its ability to change our perception of the Now than in trying to update the music to fit some idea of what's going on currently. I'm really just trying to say it's real, authentic, true. And that of course is timeless. And there is some great stuff on guitar. 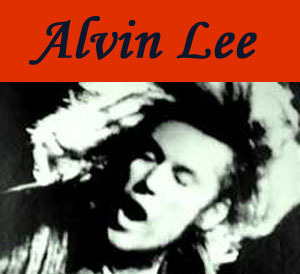 Alvin Lee follows the rockabilly tune with a pretty acoustic song titled "Walk On, Walk Tall." This one too has very simple lyrics. It begins, "Walk on, walk tall/Be strong, don't fall/Walk on to the end/Be my friend." Simple, and wonderful. I really love the guitar in this one too. It's what makes this track one of my favorites. This CD features three instrumental tunes. The first, "Song Of The Red Rock Mountain" is a really nice acoustic instrumental. It somehow manages to feel simultaneously intimate and cinematic, creating a vivid landscape, taking me out of my normal surroundings (which is appreciated). This is one of the CD's short tracks (at just over two minutes), and it feels like it ends a bit too abruptly. The album's second instrumental, "Down Line Rock," features a country rock rhythm mixed with blues, and then a seriously groovy short drum solo, with a bit of funky bass. Very nice. The third instrumental is the hidden track, a sweet acoustic number that ends too soon. More than four decades have passed since Alvin Lee stood front and center at the famed Woodstock festival with his band Ten Years After and told half million or so fans, "i'm Going Home . . . by helicopter." Forty-three years later, Alvin Lee hasn't arrived at his destination yet, as the title of his new solo album, Still on the Road to Freedom, available August 27, 2012 on Rainman Records, will attest . 'I don't think I ever will," he laughs. Recorded at Space Studios 3 in Spain, Still on the Road to Freedom finds Lee returning to his original inspirations. Longtime band members bassist Pete Pritchard and drummer Richard Newman, along with keyboardist Tim Hinkley, join Lee in a musical travelogue that is a tribute to the roots music that first influenced him. "I got my start in music listening to my dad's jazz and blues 78s when I was eight years old," says Lee, who continues to follow his inspirations. "It�s about the freedom to make music of my own choice without worrying about what other people thought or expected," he writes in the album�s liner notes. Still on the Road to Freedom nods to country-blues, embodied by Alvin's gutbucket harp on "Save My Stuff" ("I was a big fan of Big Bill Broonzy, Sonny Terry and Brownie McGhee") and the delta stomp "Blues Got Me So Bad" ("My blues name is Deaf Lemon Lee"). He evokes Johnny Cash in the stark acoustic "Walk On, Walk Tall," perfects the sensuous slow blues of J.J. Cale in "Nice and Easy," and strums south-of-the-border Mexicali rhythms in the instrumental "Song of the Red Rock Mountain," a song he made up on the spot while testing a microphone and wasn't able to improve. Lee continues to explore that creative freedom with the tribal African drums of "Listen to Your Radio Station," which includes a sample loop from the late Ian Wallace, the gospel organ of "Midnight Creeper" and the surprising funk of the rousing "Rock You." The album also features "Love Like a Man 2," a remake of the song on the band's 1970 album Cricklewood Green, inspired, according to Lee, by New Orleans R&B player Smiley Lewis' "I Hear You Knocking," with a nod towards seminal influence Chuck Berry. Asked how he'd describe himself, Lee pauses: "A musician . . . who leans towards blues, but likes rock and roll, country, funk, jazz � anything with a guitar in it." After all these years, Alvin Lee�s still going home. Alvin Lee... yes the real Alvin Lee, has just come out of the studio and is ready to release a new cd, Still On The Road To Freedom, on August 27, 2012. To say that I am a long time Alvin Lee fan is a tremendous understatement. I was a young kid when I heard Alvin Lee for the first time and it was an eye opening experience. I had never heard such music. The song was I Woke Up This Morning from the SSSH album and it was on an obscure radio station that my older teenaged sister had on in the family car. My musical interests are forever changed. This new recording with 12 new tracks and one remake that is totally unrecognizable from it's original form shows that lee is still exploring uncharted territory. The first track, the title track, Still On The Road To Freedom, follows a lot of previous jazz/blues influenced rock tunes by Lee and there is absolutely no question that Lee can still sing, write and play with the effort of a feather. Great song. He has undeniable form and tone. By the way, I have been asked before what classic guitar amp tone is.. I mean...identify it I point to SSSH. Some things never change. Midnight Creeper gets a smooth bass/drum rhythm going and Lee plays guitar and sings over this basic drive pattern. This cd has quite a bit less structure than many of his compositions of the past.It gives Lee a much less structured framework in which to work and is quite tasty if you can set aside your TYA expectations. Save My Stuff catches Lee on harp and doing a polished little blues track but maintaining his basic rock structure as in more recent solo efforts. I'm A Lucky Man explores Lees early country (rockabilly if your prefer) roots ... if you really listen you can hear Porter Wagoner as much as Chuck Berry.... that's what is great about real music... it defines definition and blurs lines. Sound Of The Red Rock captures a unique side of Lee which I have seen. It has a bit of a Spanish flare to my ear and a melody that is very strong. Nice and Easy really captures the style of JJ Cale with the laid back voices and biting guitar work. Back In 69 takes a clue from Bo Diddley but anyone hearing it would definitely peg it for Alvin Lee not only because of his recognizable hooks and distinctive voice but his unmistakable guitar playing. This song features riffs that I have never heard from Lee and is the most experimental track on the cd. I really like it. Rock You see's Lee tromping around in funky territory. Lee's voice still sounds as fresh as it did the day that I first heard it. Remarkable. Lee wraps the recording with, as I alluded to before, a remake of one of my favorites, Love Like A Man, but it is really pretty unrecognizable as the same track unless you are really listening. It takes the stance of a heavy bottomed Texas blues with a touch of swing and a rock twist. It's really quite interesting and then to top it off with Lee using not only signature riffs but multiple pinched harmonics like I never heard from Lee. Alvin Lee's creative juices are still flowing strong. This recording is not only going to delight the thousands of fans that I encounter each day but will certainly capture many many more. Oh Yeah...and don't take the cd off too fast...there's a nice acoustic track at the end of the cd. Alvin...great to have you back! Blues Wax Rating 9.0 out 10. This brilliant and ingenious album starts with an update of the title track of the original collaboration with Mylon LeFevre and ends with a new version of "Love Like A Man," albeit still with shades of one of the most distinctive guitar riffs in progressive rock history. In between is a remarkable, seamless musical journey covering several decades and genres and involving some of the most talented musicians Lee has worked with. Tim Hinkley's close musical relationship with Lee is evident from the superb interplay between guitar and keyboards, notably on the funky "Rock You" and "Down Line Rock," the latter inspired by Tennessee in the 1950s. Drummer Richard Newman maintains a solid beat throughout, punctuated with inventive fills and is a tour de force on "Back In �69'"with its complex, Bo Diddley-type rhythms. A real bonus is the guest appearance of Trevor Morais, who gives a master class on brushes and snare drum. The spirit of the late Ian Wallace lives on in "Listen To Your Radio Station," thanks to modern technology. Pete Pritchard powers the up-tempo "I'm A Lucky Man"" with his driving double bass and contributes to "Love Like A Man 2" with subtle, innovative electric bass lines. Alvin Lee, as singer, songwriter, guitarist, and multi-instrumentalist, gives the virtuoso performance of a musician at the peak of his long, varied, and esteemed career. The haunting vocals on "Midnight Creeper," interspersed with howling wolf cries, will give sensitive souls sleepless nights. �Nice & Easy� and "Walk On, Walk Tall" have a country feel whilst blues purists will love "Save My Stuff,", with Alvin's harmonica as an extension of his vocals as he journeys home to his loved one. "Blues Got Me So Bad" is another authentic, acoustic blues number that reflects Alvin's passion for this genre and his earliest influences. Fans who are addicted to the trademark piercing electric guitar solos will appreciate the intensity and frenzy on "Still On The Road To Freedom"� before anguish and despair give way to comparative calmness. However, the acoustic, finger-picking technique on the beautiful and evocative instrumental "Song Of The Red Rock Mountain� is equally memorable. Just when you think the 13-track CD is finished, wait a couple of minutes for one more surprise. Finally, all credit to the excellent quality of recording and mastering, Evi's imaginative cover photographs linking past and present and the reproduction of Alvin's creative oil painting The Road To Nowhere. So why not a rating of 10 out of 10? Well, Alvin is sure to produce another CD which will evolve from this one as part of the natural progression and freedom in his music, and that will probably be even better! It's hard to believe that it's been more than forty years ago since Alvin Lee rocked out a crowd a half a million strong with his band, Ten Years After, at the historic Woodstock festival and, as he was leaving the stage told them, "I'm Going Home . . . by helicopter." As they say in the glorious south, Lee hasn�t gotten back to the house yet and he sings about exactly that on his new solo album, Still on the Road to Freedom, returning him to his musical roots. This album is a royal treat on so many levels: melodically, lyrically, musically and just the fact that Lee is still producing great and memorable music. He�s joined on the album with bassist Pete Pritchard, drummer Richard Newman (Rory Gallagher, Steve Marriott, Mark Knopfler) as well as keyboardist Tim Hinkley (Humble Pie, Bad Company, The Who, Thin Lizzy). "I got my start in music listening to my dad's jazz and blues 78s when I was eight years old," says Lee, who continues to follow his inspirations. "It's about the freedom to make music of my own choice without worrying about what other people thought or expected," he writes in the album�s liner notes. Love Like a Man 2 is a remake of the song on the band's album, Cricklewood Green, inspired, according to Lee, by Smiley Lewis�' I Hear You Knocking. This tune alone is worth the price of the entire CD. No foolin'! The title cut, Still on the Road to Freedom, would have fit in quite nicely into Lee�s performance at Woodstock. Gutsy, bluesy, fluid. This song will have you slapping the repeat button until it can't be slapped any more, it's that good. Finally, Listen to Your Radio Station, cool and funky with some great African drum work backing up Lee's silky smooth guitar work. This song could have been times longer than it�s recorded two minutes and twenty-four seconds and I still wouldn't think it was long enough. I'd love to catch Alvin performing this tune live at one of his gigs and watch him take it as far as it will go. You have to have this CD in your collection whether you don�t remember being at Woodstock or just wish you had. This disc will wind up being on your "desert island" list of albums you can�t ever live without. I got my first look at Alvin Lee and Ten Years After when I saw them hard-charging through "I'm Going Home" in the film version of Woodstock. In short order, I began adding their albums to my collection including Ssssh (1969), which opened with the memorable "Bad Scene," Cricklewood Green (1969), best known for the song "Love Like a Man," and the apex of their commercial success, A Space in Time (1971), which yielded their highest-charting single, "I'd Love to Change the World." After Lee left Ten Years After in 1974, he produced a series of solo albums that continued to demonstrate his distinctive vocals and linear guitar chops, even if they didn't always contain memorable material. But one standout was 1973's On the Road to Freedom, which co-billed Lee and Gospel singer Mylon LeFevre. Supporting players included George Harrison, Steve Winwood, Jim Capaldi, Ronnie Wood, and Mick Fleetwood. Now, one year shy of being 40 years later, Lee has released a sequel, Still on the Road to Freedom. It not only invokes its 1973 namesake, any Ten Years After fan will find more than enough on this disc to take them back in space and time. This time around, Still on the Road to Freedom doesn�t rely on an all-star cast. Keeping close to the simplicity of roots traditions, Lee's group is Pete Pritchard (bass), Richard Newman (drums), and Tim Hinkley (keyboard). Together, they touch quite a few musical bases from very old schools. For example, the beautiful, haunting title track is not only pure Ten Years After, it's a reminder Lee was and is a lyricist who has something to say, in this case how the road to freedom never ends. "Back in '69" is another standout where Lee tells us we've gotten older and have lost the values of peace and love once so cherished by a generation. This one, in terms of the lyrics, is very reminiscent of "I�d Love to Change the World.�"
In the main, however, Still on the Road to Freedom is a musical homage to many of Lee's inspirations. Lee blows Jimmy Reed-ish harp on the straight up blues of "Save My Stuff," a nod to Big Bill Broonzy, Sonny Terry, and Brownie McGhee. The happy, shuffling rockabilly of "I�m a Lucky Man" is another tip to Lee's early rock mentors. Remember, Ten Years After got its name in 1966 in honor of Elvis Presley's breakout year, 1956. Lee pulls out his acoustic guitar for the simple blues of "Blues Got Me So Sad," the country folk of "Walk On, Walk Tall," and the luscious Mexicali instrumental, "Song of the Red Rock Mountain." The latter was a melody Lee improvised while testing a microphone and could never improve. He goes international as well for the African-drum driven "Listen to Your Radio Station," which includes a sampled loop from the late drummer Ian Wallace. Lee lets his band stretch out a bit for "Down Line Rock," an instrumental jam with nods to Booker T. and the M.G.'s. Organist Hinkley also shines on "Midnight Creeper" with an ironic, seductive gospel feel. The set winds up with "Love Like a Man 2," a remake of the Ten Years After hit with a completely new arrangement. According to the liner notes, Lee claimed the new version was inspired by Chuck Berry and New Orleans R&B player Smiley Lewis' "I Hear You Knocking." Recorded at Space Studios 3 in Spain, not all of Lee�s compositions are top drawer material. "Walk On, Walk Tall," in particular, is a series of cobbled together clich�s that almost signal this song was intended to be a parody. However, the overall feel of Still on the Road to Freedom is that of an artist who wants to share the best of what he�s loved in music since his childhood. But Lee's distinctive style and voice also fill this project with original touches that make this album far more than a reworking of basic blues, folk, country, and rock. Considering that Lee hails from Nottingham, England, it�s interesting just how much Americana is in his creative well. Most importantly, Lee left Ten Years After in order to have musical freedom, and that's the freedom he's talking about in the title. Isn't that what the better music of the '60s was all about? It's been five years since Alvin Lee's last album, Saguitar, but it's been nearly forty years since he shucked off the arena-level fame of Ten Years After and recorded 1973's country-rock On the Road to Freedom with Mylon LeFevre, George Harrison, Steve Winwood and others. His latest collects songs written and recorded over a four-year period, mixing rock, blues, rockabilly, folk and country. Lee still sings well, but it�s his guitar � both electric and acoustic � that will raise the hairs on the back of your neck. Whether he's blistering through a hard-rocker, playing a shuffle or Bo Diddley beat, riffing on the blues, or fingerpicking folk-country, Lee's playing shines in both rhythm and extended solos. Lee closes the album by revisiting "Love Like a Man" in a style that leans more to NRBQ than Ten Years After. A sweet acoustic bonus track is hidden at disc's end, providing a restful capstone to an album full of energy. More than 40 years after Ten Years After delivered a career-altering performance at Woodstock, guitarist-vocalist and band co-founder Alvin Lee is still enjoying the freedom he found when the band split up in 1974. "I decided to take the road to freedom rather than the road to fame and fortune," Lee writes in the liner notes for Still on the Road to Freedom. "I was in danger of joining the dead before 30 club." Specifically, Lee felt he had to get away from the relentless grind of touring, and from what he calls "the commerciality of the music industrialists." Even more importantly, he wanted to be free to "make music of my own choice without worrying about what other people thought or expected." It is that particular freedom that is evident through this album. Lee wrote all of the songs on the album, but he's quick to acknowledge influences from a varied group of artists and genres, from R&B icon Chuck Berry to ex-King Crimson drummer Ian Wallace. This isn't surprising, since TYA's music, although predominantly hard rock, had significant blues and jazz influences. Lee began writing songs for Still on the Road to Freedom in 2008. By the time he was ready to go into the studio, he had 33 potential tracks in hand. After wrestling unsuccessfully with trying to consider all of them, he finally isolated his favorites (a little less than half of the total) and worked them into "an entity in itself with a beginning, a middle and an end." And somehow, the mixture of arena rock, blues, bebop, country rock and folk does seem natural. Lee's guitar work, be it electric or acoustic, is as good as ever. His voice, never known for its "polish" (which is a good thing) is still natural and vibrant. Lee plays multiple instruments on the album, which he also recorded and mixed. Other band members include two longtime associates -- Pete Pritchard on bass and Richard Newman on drums -- and keyboardist Tim Hinkley. TYA (minus Lee) re-formed in 1988, but there are a lot of fans who are loyal to the original (1966-1974) lineup. If you're among them, you should put this album on your "get" list. If you're unfamiliar with either TYA or Alvin Lee, the album is a good listen just for the musicianship, and for the concept of creative freedom that drives it. You might also be able to relate to the philosophy that accompanies a painting by Lee that appears on the CD and in the liner: "There are many forks on the road to freedom and the road to nowhere is one of them." I got my first look at Alvin Lee and Ten Years After when I saw them hard-charging through "I'm Going Home" in the film version of Woodstock . In short order, I began adding their albums to my collection including Ssssh (1969), which opened with the memorable "Bad Scene," Cricklewood Green (1969), best known for the song "Love Like a Man," and the apex of their commercial success, A Space in Time (1971), which yielded their highest-charting single, "I'd Love to Change the World." This time around, Still on the Road to Freedom doesn't rely on an all-star cast. Keeping close to the simplicity of roots traditions, Lee's group is Pete Pritchard (bass), Richard Newman (drums), and Tim Hinkley (keyboard). Together, they touch quite a few musical bases from very old schools. For example, the beautiful, haunting title track is not only pure Ten Years After, it's a reminder Lee was and is a lyricist who has something to say, in this case how the road to freedom never ends. "Back in '69" is another standout where Lee tells us we've gotten older and have lost the values of peace and love once so cherished by a generation. This one, in terms of the lyrics, is very reminiscent of "I'd Love to Change the World." In the main, however, Still on the Road to Freedom is a musical homage to many of Lee's inspirations. Lee blows Jimmy Reed-ish harp on the straight up blues of "Save My Stuff," a nod to Big Bill Broonzy, Sonny Terry, and Brownie McGhee. The happy, shuffling rockabilly of "I'm a Lucky Man" is another tip to Lee's early rock mentors. Remember, Ten Years After got its name in 1966 in honor of Elvis Presley's breakout year, 1956. Lee pulls out his acoustic guitar for the simple blues of "Blues Got Me So Sad," the country folk of "Walk On, Walk Tall," and the luscious Mexicali instrumental, "Song of the Red Rock Mountain ." The latter was a melody Lee improvised while testing a microphone and could never improve. He goes international as well for the African-drum driven "Listen to Your Radio Station," which includes a sampled loop from the late drummer Ian Wallace. Recorded at Space Studios 3 in Spain , not all of Lee's compositions are top drawer material. "Walk On, Walk Tall," in particular, is a series of cobbled together clich�s that almost signal this song was intended to be a parody. However, the overall feel of Still on the Road to Freedom is that of an artist who wants to share the best of what he's loved in music since his childhood. But Lee's distinctive style and voice also fill this project with original touches that make this album far more than a reworking of basic blues, folk, country, and rock. Considering that Lee hails from Nottingham , England , it's interesting just how much Americana is in his creative well. Most importantly, Lee left Ten Years After in order to have musical freedom, and that's the freedom he's talking about in the title. Isn't that what the better music of the '60s was all about? When it comes to Woodstock-era English blues guitar, there isn't a more underrated axe than Alvin Lee. Yet his blistering fret work as the frontman for Ten Years After continues to resonate through the steel strings of such modern-day mavericks as Jack White, Dan Auerbach and Guy Davis Jr. as adroitly as fellow Brits Jimmy Page and Eric Clapton, whom the guitarist should be placed alongside more regularly in terms of his influence on the art of those who came after him. And on the 40-years-in-the-making sequel to his landmark 1973 LP On the Road to Freedom, co-billed with American gospel great Mylon LeFevre, Lee burrows into his roots in not only the blues but jazz and outlaw country as well with his strongest set of material in many years. Still On the Road to Freedom might not harbor the kind of star power its predecessor may have brandished with cameos from such marquee names as George Harrison, Steve Winwood, Jim Capaldi, Mick Fleetwood and Ron Wood. But with a tight unit comprised of longtime cohorts Pete Pritchard on bass and drummer Richard Newman and keyboardist Tim Hinkley, Lee takes a relaxed journey through his past while bringing his 50-year pedigree into the modern age. As with just about everything he's done since his days as leader of the underrated British Invasion act The Jaybirds, a deep love for Southern American blues flows through the bloodstream of Freedom, perhaps his purest LP in that sense since Ten Years. "Save My Stuff" echoes the country blues 78s he grew up listening to, while Naturally-era J.J. Cale is evoked on "Nice and Easy". Meanwhile, Lee utilizes a fusion of syncopated African rhythms and a loop based upon a sample of the late King Crimson drummer Ian Wallace for the AOR nod "Listen to Your Radio Station" and draws inspiration from New Orleans R&B pioneer Smiley Lewis' chestnut "I Hear You Knocking" to transform the deep Cricklewood Green cut "Love Like A Man" into something you'd hear on the HBO series Treme with a nod to his burning love for Sun Records rock to boot. Still on the Road to Freedom is a refreshing return to form from one of England's most invincible guitar gods.